Sorry I didn't post the tutorial sooner. I could not get the template to print to scale. Annoying! When printing the template, the face of the envelope pattern (meaning, not including the top and side flaps) should be approximately 3 7/8" x 5 1/2". You may want to reduce the top and bottom margin of your printer to zero. Because of the size of the pattern, it may print on two pages. . .you will need to cut and attach the end piece to the first page. The pattern in whole should fit on to an 8 1/2" x 11" cardstock. Today's Daily Special is "Anything But Cards". I call this project "Envelope Accordion Album". I didn't really use an envelope but I used an envelope template to create the base that looks like an envelope but has a cardstock quality. I suppose you could use an envelope but I wanted the base to be a little bit more sturdy. This album fits into a 5 1/2 x 5 1/2" square envelope. I'll add a tutorial of this project tomorrow. I need to work on it. It's a very simple project. It don't even have to be a scrapbook album. 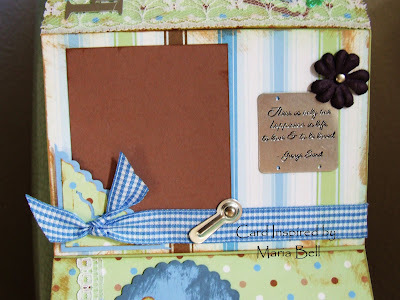 You can create it as an accordion card rather than an album. If I have time this evening, 'll make a few more of them and post it maybe tomorrow. Scroll down to see the whole project. . .
Don't forget to participate in the blog candy - scroll down for the post. Drawing will be on Wednesday, May 2nd. Good luck!! If you want, once the album is opened up, you can take the ribbon at the top and tie on to a hook and display the album opened. Today's Daily Special is Featured Stamp. . .today's stamp or stamps are "Stampabilities Born to Shop Series". I received my package today with all the stamps I purchased. Scroll down for the picture. I love these "girlfriend" style stamps. The first one says "Whenever I get the urge to exercise, I lie down until the feeling passes" Oh so true, so true! Haha! Honestly, I never get the urge to excercise so I really don't need to lie down to making the feeling go away! The second card says "Good Morning, let the stress begin". Fortunately, my mornings are not stressful. I trained my husband and my kids really well. They are all very self-sufficient and self-sustaining. Really, I'm not kidding. Other than being the school bus driver to the kids, my mornings are relatively mellow! I'm not going to write the details of the cards today, well. . .because I just don't feel like it right now. If you are interested in the details, email me and I'll provide the info to you. We ate breakfast on our patio in the backyard this morning! 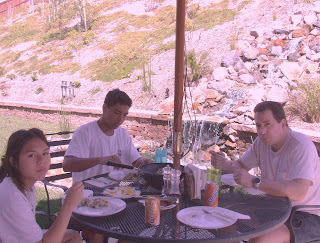 Below is a picture of my husband and the kids eating breakfast. Moody people, I swear. I asked them to smile for the camera and they basically iignored me. It was a great breakfast, nonetheless. We listened to classical music through the intercom speakers while we ate breakfast. It was pretty cool. Don't forget to scroll down for the sketches!! Here are the rubber stamps I received yesterday! Whoohoo. I have three more I'm waiting on and that's it with the Born to Shop series stamps. I bought all of them!! Don't forget to participate in the blog candy!! Until later!! 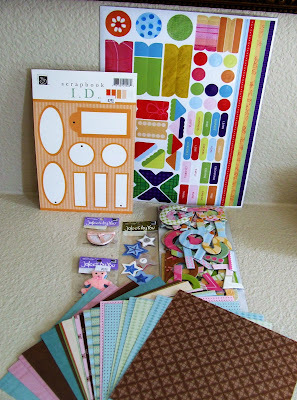 I love mixing scrapbook embellishments and scrapbook paper with my rubber stamped cards so I thought this was a good mix of stuff for a blog candy. 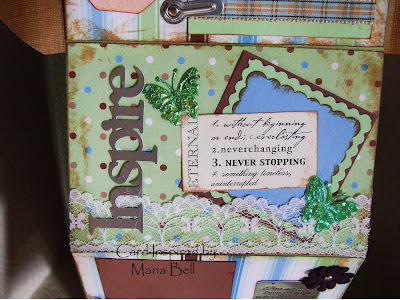 I especially love the alphabet chipboards right now so I decided to share some with you!! I have a blog candy going on my Stampin Inspirations Blog Site but I want readers to this blog site to participate as well! Tell me who you've seen in concert live in person and in parentheses, add a little note about the concert like I did with my list. Lastly, add one band or entertainer you wish you could see in concert. Rex Smith (haha, don't laugh - do your remember him?) - If you can tell me who Rex Smith is, I'll add an extra goody. I've seen more concerts but I can't remember all of them right now. They were mainly rock concerts in the 80s. I'm going to see 30 Seconds to Mars, the Used, Plain White T's, the Bravery, Say Anything, Social Distortion, and more to be announced on X-Fest San Diego on May 20th. Whoohoo! Can't wait to see them!! The band I wish I could see in concert is GreenDay. Now it's your turn. . . 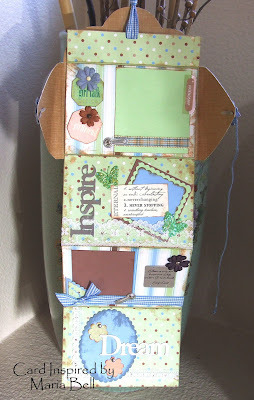 I made another box like this one on my Stampin Inspirations Blog Site using Stampin Up stamps to decorate the box. Check it out! Yuck I hate how the picture came out under artificial light. It looks better in natural light but well, it's 8:40 in the evening and no sunlight in sight. Today's Daily Special is "Anything But Cards". I haven't made a non-card project for a while now so I decided it would be a good time to do it. This is a "Pocketbook Box" in the case you're wondering what it is. I bought a box template at Target yesterday. They had a bunch of them and they were fairly reasonably priced - $3.99 - not bad. The templates are made by Paper Bouquet and the "Pocketbook Boxes" came with two templates - one box is 4 1/4 x 4 1/4 and the other is 3 1/4 x 3 1/2. Did you know that the "frilly" bead thing was something I bought 3 years ago - again, like always because they were on sale and they were pretty. I wasn't sure what I was going to do with them but it didn't matter at the time. Well. . . I finally found a project that I could actually use it for. It's a good thing despite my disorganization, I still know where most of my stuff are stored. Anyway, below is a picture of the box template I bought. Sorry about the bad photo. Anyway, back to creating! Maybe if I remain focused, I can finish up one more project before I go to bed. Aloha Everyone!! My "Featured Blogger of the Week" is Jen's blog site "Pieces of me". Her blog site is awesome with lots of creative ideas! Jen is a local girl from Hawaii just like me! It's nice to connect with someone back in my home state of Hawaii. Jen is also a Stampin Up demonstrator. Yay! As an added bonus, her blog site contains recipes for local/Hawaiian cuisine. Yummy! Her blog commentary is up-beat and very interesting to read. . .it's like she's talking to you as she would a friend. 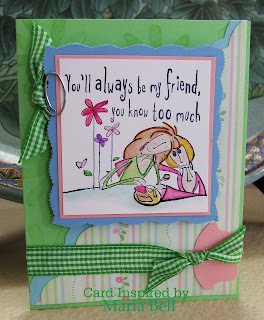 Be sure to drop by her blog site and see all the creative and beautiful cards and projects she has to offer!! I know, I know. . .you're saying "dang, that's a humongous flower". Yeah, it is. About 3 months ago I bought a box of silk flowers at JoAnn . .why? Well, because you know it. . .it was on sale. I used one of the flowers and the box went into a drawer never to be seen again. Well. . .like a crazy nut, I went over to Target yesterday and bought another container of paper daisies. How stupid is that? Anyway, I decided in order to justify what I bought yesterday, I needed to use up the flowers I bought 3 months ago. Now you can understand why the last 2 posts were cards decorated with the silk flowers. I wanted to explain why I called this card a mixed media card. First of all, there's a lot things going on with this card although it may not seem like it. 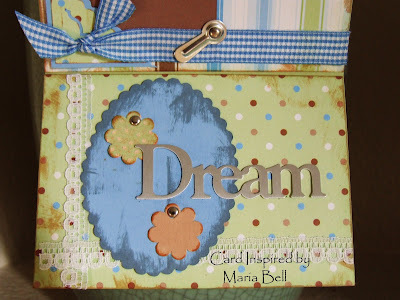 I took a piece of textured Bazzil cardstock and painted it with white acrylic paint sort of to give it a shabby chic distressed appearance and to also give it a bit more texture. I then distressed the edge with a cardstock distresser. I did a review on it a while ago. . it's a product made by Heidi Swapp. Great stuff by the way. I'll link the post later. The edge of the background paper was shaded or shadowed by scraping Stampin Up Baroque Burgundy ink with a sponge. 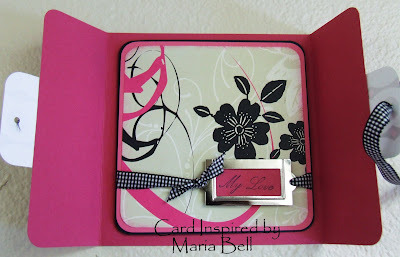 The sentiment is by Hero Arts and it was heat embossed with an off white embossing powder. I don't know who is the maker of the big a** flower because I threw away the label. The ribbon is a ribbon I bought at Michaels - Dashes, Dots & Checks, the butterfly is by Card Connection, and the button by JoAnn Essentials. The scrapbook paper is by DCWV Value Pack and the cardstock used are black and a white speckled cardstock by Stampin UP. Don't forget to scroll down for the sketch. The big circle represents anything you want. . .an image, a flower, whatever. . .
After a week of having the poll up and and 217 participants vote, it appears that most of the voters feel I should incorporate my paper-craft/paper piecing cards and scrapbooking projects in to my current rubber stamping blog sites. I will close the poll and take your choice into consideration and will start posting those types of cards on to my Card Inspired Blog site. Thank y'all for taking the time to vote! I appreciate it! 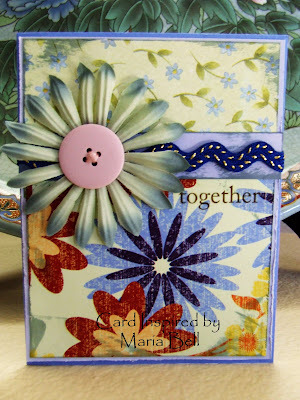 When I first started rubber stamping, I made mixed media and collage cards. 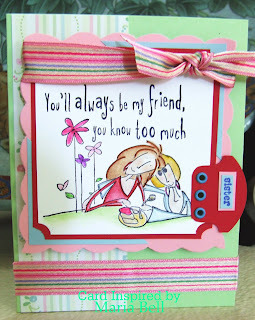 Because scrap embellishments were expensive, whenever I sold the cards I had to compensate for the cost of the materials and noticed that the cards would not sell as well as the rubber stamped "cutie" cards that I made. Considering it was not cost effective, I made less and less of the mixed media cards. Unfortunately, I have a TON of scrapbook embellishments sitting and waiting to be used. I've always found the expectations of buyers of handmade cards quite interesting. When it comes to the cost of handmade cards, a lot of times, they feel it should be "cheap" because they are handmade. 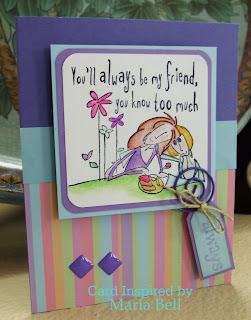 Store bought cards range from $4 to $6 but many buyers will buy a store bought card for that amount and hesitate to purchase a handmade, 3D, artwork for more than $2.00. Store cards are pumped out in a matter of seconds out of a printing machine and there's hundreds of the same card sold in stores. There's no depth or character to the cards. . .just a bunch of ink. Handmade cards, on the other hand, can at times take hours to make, the card is one of a kind and carefully and at time painstakingly made with expensive designer papers and embellishments. I don't understand why a buyer would even think that it's too expensive if the card cost $5.00. In my opinion, $5.00 is cheap for a well made card. Oh, well. . The handmade card business is not at all a lucrative business. Luckily, I love making cards regardless. . 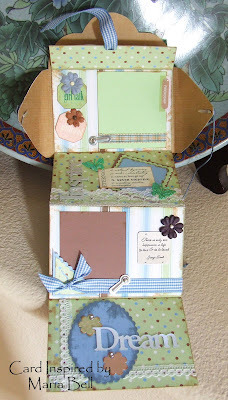 Anyway. . .here are a few cards I made using scrapbook embellishments and papers. 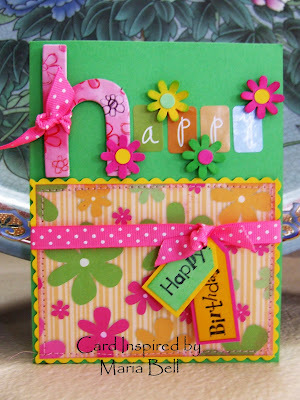 I'm usually drawn to bright cheery colors but I decided to create a card using subtle colors. I have a large pile of scraps of scrapbook paper. Considering a sheet of scrapbook paper is 12 x 12", well that's a lot of paper. 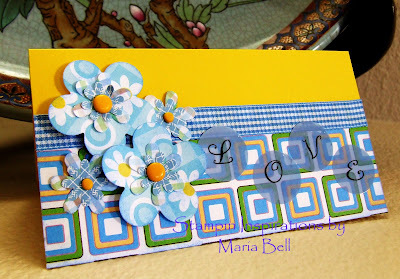 I don't like to create cards consecutively using the same materials so what happens is I end up with a stack of scraps. Aggghhh. . .
My goal this week is to clean out my scrap pile . . .at least reduce it a bit. The large flowers were rubber stamped on to scrapbook paper then colored in using Prismacolor markers. 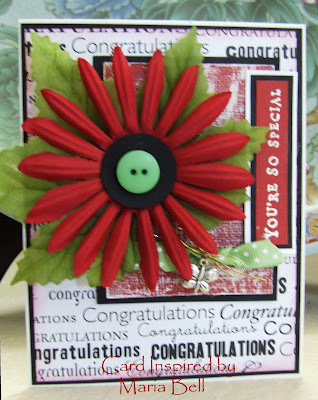 The center of the flower was rubber stamped on to another piece of scrapbook paper then cut out. I then remounted the center of the flower using foam tape to give it a 3D effect. Random Card - Did I Hear You Say "Bright"! Yup, it's bright that's for sure. . . and busy but I kinda like it. If you look closer at the patterned paper, I sewn the stitch with an actual sewing machine. . .no faux stitching on this one. It's the real deal. I had a bunch of scraps that I wanted to use so this is what I came up with using pieces of scrapbook paper, ribbon, and cardstock. Yay! Another Daily Special. Today's special is "Technique Day". 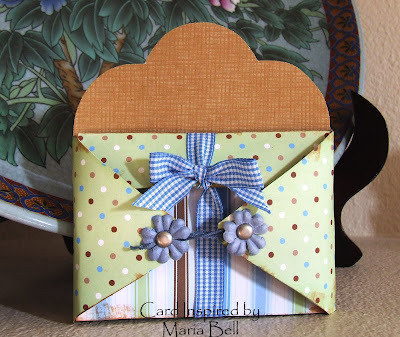 This tutorial is called "Square Coat Card". Honestly, I didn't know what to call it. Maybe someone could come up with a better name. The design concept was inspired by a card cover I saw on Paper Craft Magazine Card Creations Volume 4, page 18 by Michelle Tardie. It's an adaption of the card holder. The design on the magazine was a card holder type of design. The size are not the same and the insert is different. Anyway, the base card is attached to the outer coat so I called it a "Coat Card" because it's actually a card and not just a cover. The card fits into a 5 1/2" x 5 1/2" square envelope. 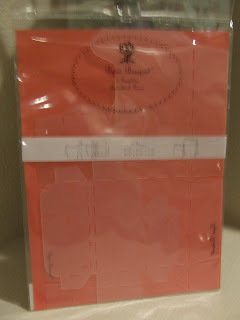 Stampin Up sells this size square envelope in the case anyone is curious where to find an envelope for this card. I did not create a sketch because the base card design is too simple. Scroll down to see how the card looks when opened up. 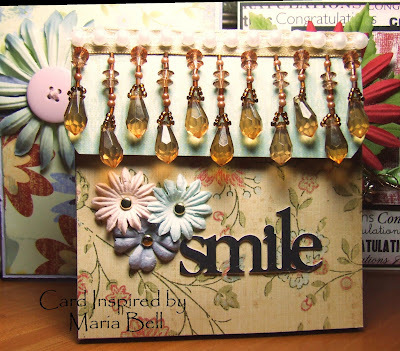 Try out the tutorial and if you want to send me a picture and I'll post your card on to my blog site as a "guest stamper". 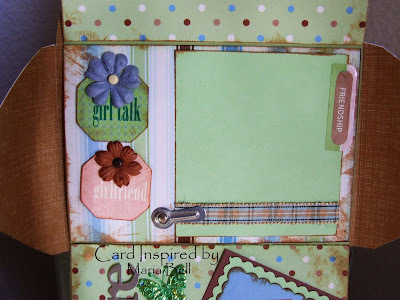 I did a tutorial on a "Fun Shaker Card"on my Stampin Inspirations Blog Site so go check it out. If I have the time, I'll create a sample for this blog site and link the tutorial. Thank you for all your comments on my "just wondering if anybody reads my blog" post. There's times when I don't feel like writing anything but I sometimes feel I have to add a commentary to accommodate my pictures and sketches. It's more to fill up space, I suppose. There's days when I just feel like writing about whatever that's going on in my life and that's more for my personal motivation . . .like a diary but I always feel I have to explain how I created the card for every post. Most of the time, the pictures are self-explanatory but I'll write about it anyway. For those who read my posts, thank you for your interest. I'll continue to write how I created the cards and the materials used but there's days when I'll just give a brief commentary. If you have any questions, I welcome any questions you have. Just email me and I'll answer your question as best I can. Now back to making cards. See y'all later. . .
Well this is the last card of the day. I've run out of my light source to take pictures of my card (I only take pictures of my cards during the day). I was a really good girl today. I actually created a lot of cards. 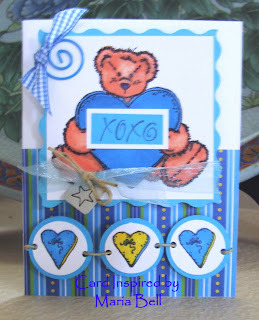 Here is another card using paper clips as embellishments. This time, the flowers were not punched but I cut out flowers from a scrapbook paper. 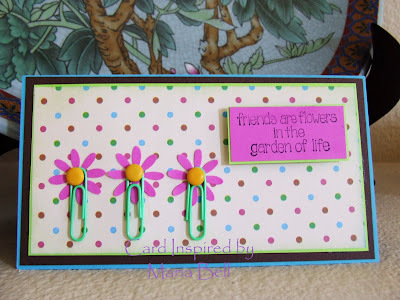 I liked the flowers so I decided to use the flowers for my paper clip design. Like my previous post, I attached the flowers on to my background design, punched a hole, glued the paper clips with tacky glue . . .the difference with this one, I used a 1/2" circle punch, punched a center using scrapbook paper and attached small brads to finish up the paper clip embellishment. Do you have paper clips and don't know what to do with them? 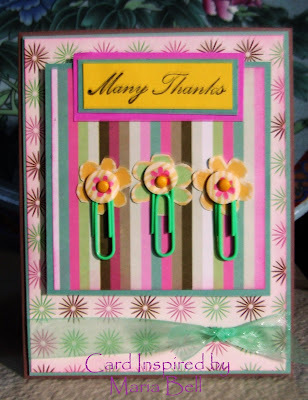 Here's a fun way to use paper clips to embellish your cards. It's very simple to create. Just punch a flower. . .in this case I used Marvy flower punch . . .but any flower punch will do. . .glue the flower on to your background layer and punch a hole through each flower. To attach the paper clips on to the card, I used Aleene's Clear Gel Tacky Glue and to finish up the card, I used large circle brads. This is a simple card design, therefore, I did not create a sketch for this card. 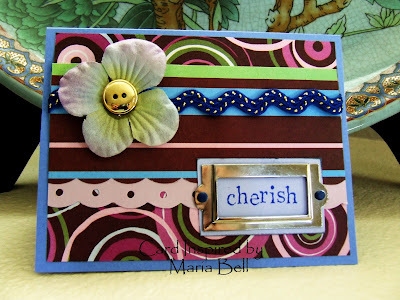 Sometimes it's not necessary to create an overly decorated card. . .simple cards can be pretty too. I'm just wondering if anybody reads my posts or just look at the pictures and sketches. I'm thinking of writing less because if nobody reads it. . .well, what's the point, right? I was thinking of posting just the pictures and card detail and write less commentary. What are your feelings? Quite frankly when I do look through blogs, many times I don't read the post unless I'm curious as to how the card was made. If the picture is self-explanatory, I don't always read what is written. It's not that I don't find it interesting. . .it's just that sometimes I just don't have the time so many times I'll browse through blogs quickly. 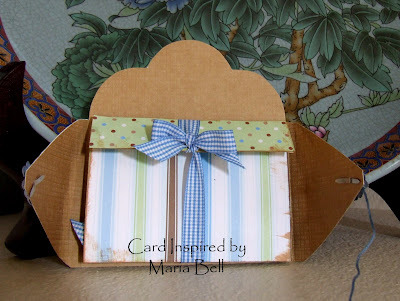 The card above was inspired by a card created in Paper Craft magazine. The card is in the April/May 2007 publication on page 25 designed by Melissa Phillips. Do you subscribe to Paper Craft Magazine? 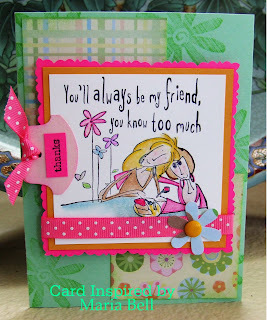 I did but stopped because I've never, ever created a card using any of their samples. What's the point of buying the magazine when I don't do anything with it other than flip through the pages so I decided to start looking through the magazine and actually recreate cards that are highlighted in the magazine. I rarely CASE cards. . .not that I don't want to but I tend to make cards randomly based on what materials I have sitting in front of me or in close proximity. CASE'ing a card sometimes requires specific materials. For this reason, I would have to dig through my stuff which can take time . . .a lot of my stuff are piled on top of one another and not in a very organized fashion so digging through them can be frustrating. CASE'ing also requires deliberate planning which I am so not about. I'm a very random and spontaneous sort of person and hence, my tendency for disorganization. To create cards with some organization is actually a lot more difficult for me than slapping a card together with no advance planning. Okay, here is a test. . .if you read my commentary above, please post a comment. This will tell me if anybody actually reads what I write. If I don't receive responses then this sort of indicates that you don't read what I post and that maybe I should write less and focus mainly on posting pictures and the materials used. Today's Daily Special is Paper Piecing Cards. 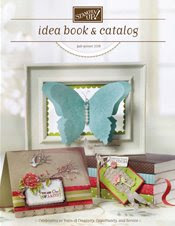 Above I have a poll in progress asking if I should create a new blog for paper craft projects. . .cards and projects primarily using scrapbook pieces and embellishments with no rubber stamping. The consensus appears to be that I should incorporate these types of cards and projects into my current blogs. I'll keep the poll going and at the same time create paper-craft cards and projects and see if the consensus changes. 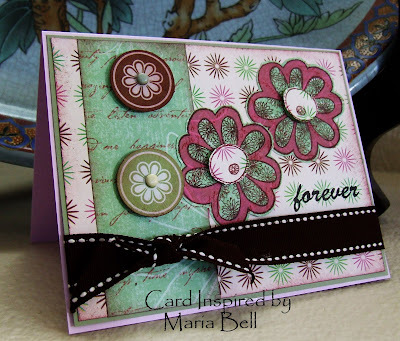 This card was created primarily using scrapbook paper, paper punches, and stickers. The flowers were created using Marvy Flower punch and two types of flower punches by Stampin Up (Daisy and Spring Bouquet). The "LOVE" sentiment was created using "EK Success Tag Types" stickers. These stickers are great because they're actually suppose to be attached to metal framed tags. I realized after I already stuck it on to the card that I was suppose to stick it on to a circle tag. 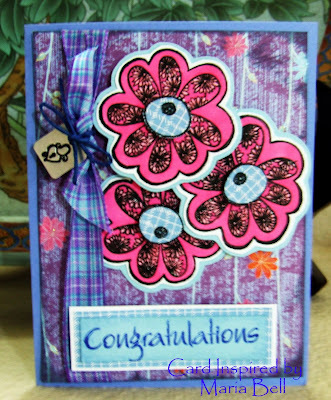 To top off the card, I embellished the flowers using JoAnn brads and line the background design using Basic Basic gingham ribbon. As a note the circles represent a shaped design such as flowers, circular designs, and tags. It's your choice as what you want the circles to represent. I've Been Tagged. . . .
Well, I've been tagged and I posted it on the wrong blog site. 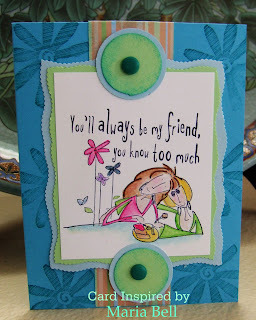 I post it on my Stampin Inspirations site, but the tag is linked to this blog site. . I was tagged by Allison at Stampin When I Can. This one is fun, so I'll play. Each player starts with 7 random facts/habits about themselves. People who are tagged need to write their own blog about their seven facts, as well as these rules. At the end of your blog, you need to choose 7 people to get tagged and list their names. Don’t forget to leave them a comment telling them that they have been tagged and to read your blog! Since I post the tag in the wrong blog site I'll do another 7 facts. Check out Stampin Inspirations for the other 7 facts/habits about me. ****When I started my clinical rotation with cancer patients while I was a nursing student, I began to develop a fear that I may have cancer too. I began to obsessively check my neck for lymph node swelling because many patients who had cancer first noted something was wrong when they found a lump in their neck. I, from time to time, still check for lymph node swelling but I no longer do it obsessively. ****When I was 7 years old, I first watched my first "Vampire" movie. Scared me beyond belief. Because of this movie, I can't sleep without my neck covered with my blanket. It can be a 100 degrees and I will cover my upper body especially my neck but the rest of my body don't need to be covered. I no longer am afraid of "Vampires" but it's become a habit of sleeping with a blanket covering my neck. ****I'll turn on the TV while I'm rubber stamping. I don't necessarily watch the shows on TV, I just like the noise. ****I love to eat the fatty parts of steak and the skin of chicken. My husband and kids skim off their portion and give it to me. They think I'm gross. ****I've bought rubber stamping and scrapbooking items from 3 years ago and still have not used them. I'll buy something and place them in a box or drawer then forget about them. I will buy them again not realizing I already bought them. ****My favorite band is 30 Seconds to Mars and I have a crush on Jared Leto. I think he is an awesome singer and actor. ****I'm originally from Hawaii but now live in California. I miss the yummy ethnic cuisines in Hawaii. I mean. . .I really miss it and so does my kids. Sometimes we'll discuss missing the food there like we're talking about missing a person or loved one. Okay gals, it your turn. . .
Shane Bernier is a courageous seven-year-old boy from Lancaster, Ontario who was diagnosed with acute lymphoblastic leukemia when he was only five. On June 6th, 2006 Shane and his family received some unfortunate news: Shane experienced a relapse after completing 108 of 130 weeks of treatment. However, despite the bad news, Shane has managed to keep a positive outlook on his situation and has made a heart-warming wish... He hasn’t asked for money or toys or anything of the sort. Instead, his birthday is on May 30th and he would like to break the world record for the most birthday cards ever received. His goal is 350 million cards. With every card, Shane’s courage grows. Something as simple as sending a birthday card could be enough to help Shane find peace and joy in his current circumstances. Please take the time to send a card to Shane and make his dream become a reality. Share his story with your friends, family and co-workers. If at all possible, get your youth groups, church congregations, employees, neighbours or communities to set aside a few minutes to write a thoughtful note to Shane. I was suppose to post the card before my last post but forgot to take a picture of it and me being lazy, decided to post about something else. This was suppose to be a continuation of my post yesterday in regards to Prismacolor Markers. I colored the bear with the markers and right now, it's my favorite color medium. The problem with markers is well, they tend to run out faster than other mediums. Anyway, I highly recommend the markers. It's difficult to see it in the picture because unfortunately, I took a blurry picture of the card but parts of the bear have a highlighted appearance. How did I do that with markers? Prismacolor has a blender pen that can be used to remove or dull a bit of the marker color to give your images a bit of a highlight. Without highlights and shading, your images appear "flat". Anyway. . .
On a personal note, I feel a little depressed today. It's raining, the sky is grey, and I just don't do well in this sort of weather. I mean. . .I don't dislike rainy days, just that it dampers my mood. I've always been this way. I'm alone in the house today and the house is way too quiet. I don't mind being by myself. . .I actually love my own company but when it's quiet and dark, it brings me down. Okay. . .enough of the woes me stuff! I'm going to turn on my stereo and listen to some rockin' music to brighten my melancholy mood! Rockin' music always make me brighten up - especially my favorite band "30 Seconds to Mars"!! Yay! Today's Daily Special is to showcase a "Featured Stamp", in this case a brand of stamps. 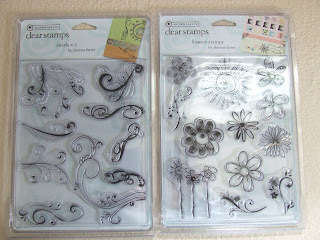 A few weeks ago, I came across a bunch of clear stamps at JoAnn in the $1 racks. The stamps were by Autumn Leaves and I thought they were just some obscure stamp company. Last week, I went over to Target and I saw sets of Autumn Leaves clear stamps and realized the stamp designs were beautiful and reasonably priced. I then looked through the Internet and realized that Autumn Leaves have a whole line of rubber stamps and scrapbook papers and embellishments. The Autumn Leaves stamp designs tend to be more on the "doodle" type of designs and I absolutely LOVE them! I want to buy all their sets! Seriously, I do. Unfortunately, I sort of splurged on so many other stuff the past few days and I need to wait a bit before I can buy the stamps. Check out Autumn Leaves online and you'll see that their stamp designs are very "in". Doodle designs are quite popular right now. I bought 2 sets of stamps at Target (shown above) and they were $9.99 each. I mean for the design of stamps and the amount of stamps in each set, WOW. . .that's a deal! I'll be making a few cards in the next few days using the stamps that I recently purchased. This card was created by rubber stamping the image on to white cardstock, then I colored it with my brand new Prismacolor Markers that I bought yesterday (see yesterday's post) and cut out the image! I then restamped the image on to scrapbook paper and cut out the center part of the image and mounted it on to the flower using foam tape. I matted the flower on to a light blue cardstock and cut around the flower. I arranged the flowers in a way to give them a multi-dimensional appearance meaning the bottom flower is flushed against the base, the second flower raised slightly and the third raised above the second flower all with the use of foam tape. I went over to JoAnns today and bought a set of 24 Prismacolor Premiere Art Markers!! (See pictures below) Big deal, you say. . .well, that's not the good part. JoAnn has a lot of clearance stuff so if you haven't been there lately. . .I suggest that you go. You may find a lot of yummy stuff like I did. I browsed over to the art section, looking to see if there's anything there that I may want to buy. At first, I didn't notice the little tags that said "clearance". There were a lot of them but I just didn't see them for some reason. I looked down and at the very bottom, I noticed a clearance tag saying . . .(here's the good part). . .Prismacolor Markers Set of 24 regular price $89.99, now $24.99. WHAT! I had to check it several times to make sure it was correct. I've been wanting to buy the markers for such a long time but even with a 40 to 50% discount, they were too expensive. I didn't want them THAT bad. Anyway. . .I went to the cashier to pay for my stuff and the markers didn't scan as a sale item. Well. . .I wasn't going to let that deter me. . .I ran over to the art section and took the tag off the shelf and showed it to the cashier and she was like "wow, I guess it is on sale". Yeah. . .you bet it is!! I now know why it is sooooooooooooo expensive! The stuff is AWESOME!! I mean AWESOME. It's like no other marker. I hate coloring with markers. . .it soaks through the cardstock and leave all sort of uneven markings. Well. . .not Prismacolor Markers. I cannot even begin to tell you how VIBRANT the colors are. . . There is a drawback. . .if you like to shade and add highlights, you have to be a little artistically inclined. Thank God for the art classes I took in college. I bought a blender pen used for markers a while ago and that is how I added a bit of highlight to the bear. It's not really visible in the picture but there's shading and highlights in the coloring. The blender pen by Prismacolor removes some of the markers color. . .well, not remove it. . .sort of dulls it. The colors on the card are layered with adding and removing then again, adding color. I decided I loved the markers so much, I went on Ebay and bid on the whole set of 156. Hopefully, I'll win it. I'll find out on Saturday. Wish me luck!! The History of My Blog Name "Card Inspired"
LadyDiana commented on my previous post that my blog tile should be called "Cards Inspired" as opposed to "Card Inspired". Here is a little bit of history as to how I came up with the title. When I first discovered rubber stamping, I wanted to have a trademark signature for my cards. Because a card that I create is an individual card, "cards" did not fit the signature. Later, when I became more involved in card making, I wanted to start a home business of selling handmade cards and I needed a name for my business. Because I signed the back of the cards "Card Inspired by Maria", I wanted to match my business name with my signature. My husband obtained a license to own the name "Card Inspired by Maria". 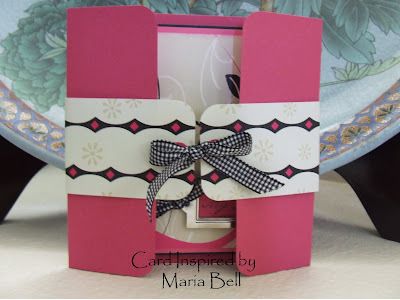 That is the reason why my blog name is called "Card Inspired by Maria". As you can see, my watermarks are "Card Inspired" and it's fitting because it applies to a picture of a single card as opposed to a picture of multiple cards. BUT, because I make more than one card in reference to this blog site, technically, it should be called "Cards Inspired" rather than "Card Inspired". 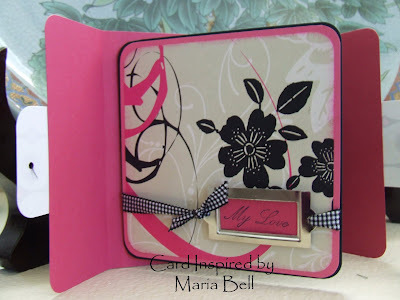 I'll stick to "Card Inspired by Maria" because the name is licensed for me to use exclusively. I Have a New Header People!! Yay!! Hey look. . .I've got a new header. I know, I know, it's a little HUGE but I can't seem to make it smaller. I took a picture of a scrapbook paper and edited the text using a photo editing program. I'll keep it for now. Did you know that this is my 3rd header that I've created. It's like making cards. . .I keep wanting to making new ones. 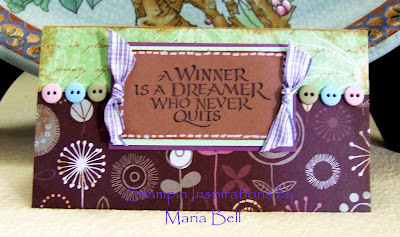 Now on to Stampin Inspirations. . .I have a new header for that one too. Today's Daily Special is Sketches, Sketches, Sketches. I made a bunch of cards using the same image but created distinctively different cards by changing the layout and color combination. I think the layout is a very, very important component when creating a card. Being able to create a totally different card using one rubber stamp by changing the elements of a card is important because we have tendency to buy many, many rubber stamps. We want a card to look different rather than changing the layout of the card we'll buy a new rubber stamp. Rubber stamps are EXPENSIVE and not all of us can purchase so many of them. As a stamper who have a tendency to buy a lot of rubber stamps and rarely at times use them more than a few times, I find it amazing that I do that. I do have a personal goal to use my rubber stamps at least several times before I move on to another rubber stamp. For example if the stamp cost $7.00, I'll make sure that I make at least 7 cards minimum. Anyway, before you buy a new stamp, create 5 cards using the 5 sketches below using a set of the same rubber stamps. Have fun!! My Craft Room is a MESS!